2016 World Figure Skating Championships Photos, News, and Videos | Just Jared Jr.
Gracie Gold stuns on the ice in a red hot costume during the Ladie’s Free Program at the 2016 World Figure Skating Championships held at TD Garden on Saturday night (April 2) in Boston, Mass. “Obviously I’m really embarrassed and I’m really ashamed with how I’m skated,” the 20-year-old athlete shared after her performance, which left her in 4th place after the competition ended. Ashley Wagner Wins Silver Medal at World Figure Skating Championships 2016! Ashley Wagner just ended the 10-year medal drought for the US Figure Skating Ladies Team! 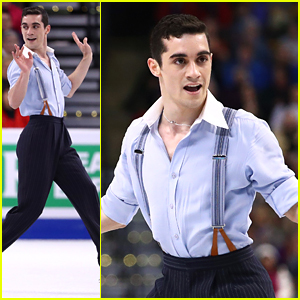 The 24-year-old skater performed one of the most stunning and clean performances at the 2016 World Figure Skating Championships held at TD Garden on Saturday night (April 2) in Boston, Mass. Teammates Gracie Gold placed 4th and Mirai Nagasu was in 10th. Russia’s Evgenia Medvedeva and Anna Pogorilaya were 1st and 3rd, respectively. Maia and Alex Shibutani nail their lift on the ice during the Free Dance Program at the 2016 World Figure Skating Championships held at TD Garden on Thursday night (March 31) in Boston, Mass. The brother and sister team came in 2nd, claiming the silver medal, after France’s Gabriella Papadakis and Guillaume Cizeron. The two other USA teams Madison Chock and Evan Bates were in 3rd, and Madison Hubbell and Zachary Donohue came in 6th. “As @maiashibutani and I stood on the ice last night surrounded by an incredible crowd, we told each other to ‘Remember this moment. Remember this feeling.’ What is the ‘feeling’? Joy… Love… Pride… Gratitude… So many things,” Alex wrote on Instagram after the event.